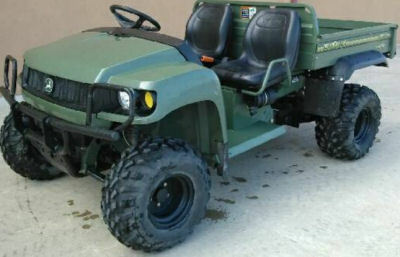 The 2006 John Deere Gator for Sale is a 2006 John Deere HPX 4X4 with 215 HOURS on it. This Gator has a LARGE DUMP BED, 4X4 and a LIQUID COOLED 615cc KAWASAKI ENGINE. This John Deere Gator is like new and would be a GREAT vehicle FOR FARMING ACTIVITIES OR FOR HUNTING SEASON. GoGoCycles would also encourage bikers to submit a review of the 2006 John Deere Gator for Sale for sale to make the biker community aware of any problems that are common to this John Deere 4X4 or to highlight its positive features and help potential buyers make informed decisions. You won't find a better price on a low hours John Deere Gator for sale arround Waco TX Texas, on Craigslist or Ebay so hurry and make an offer before this NICE 4 wheeler, utility vehicle gets away from you! My asking price for the Gator is a very cheap $6250 and at that price it won't last long so call me (NO EMAILS) at 254 756 7eight00 (and don't forget to mention that you found this ad on GoGoCycles Used Motorcycles for Sale gogocycles.com) (and PLEASE remember to include your contact information in your email or to provide a phone number or email address if you leave a message!) so that I can respond with answers to your questions or after consideration of your best offer as quickly as possible.